So before 2012 rolled to a close, Cooler Master handed us what they call the CM Storm QuickFire TK packed with Cherry MX blue keyswitches for us to review. In case its name hasn’t given it away yet, the QuickFire TK features the tenkey pad, but that’s not all. 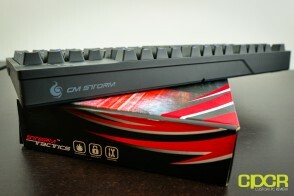 It also features the tenkeyless formfactor of the CM Storm QuickFire Rapid. Confused and wondering what a tenkeyless keyboard with a tenkey pad even looks like? Let’s jump in and take a look at what Cooler Master has created. 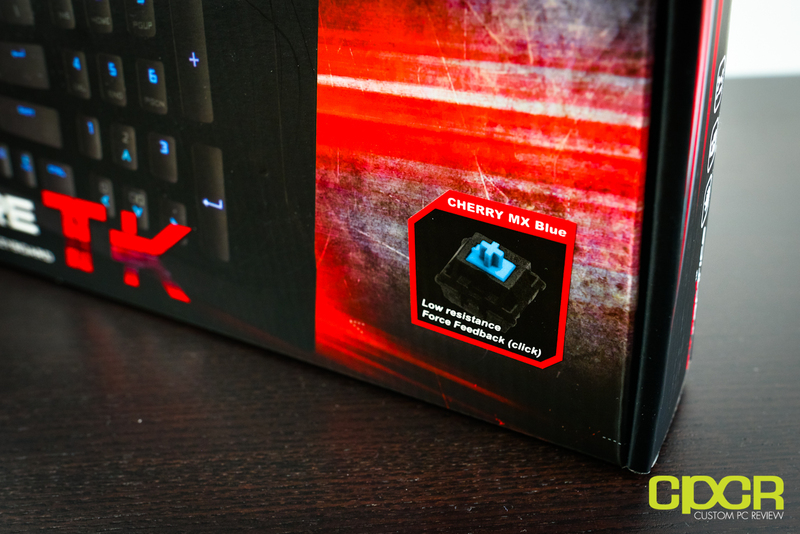 Here’s a look at the box, which gives us a clue of what Cooler Master has done to incorporate the tenkey pad despite the tenkeyless formfactor. We can also see here that the model we have here includes the Cherry MX Blue keyswitches. 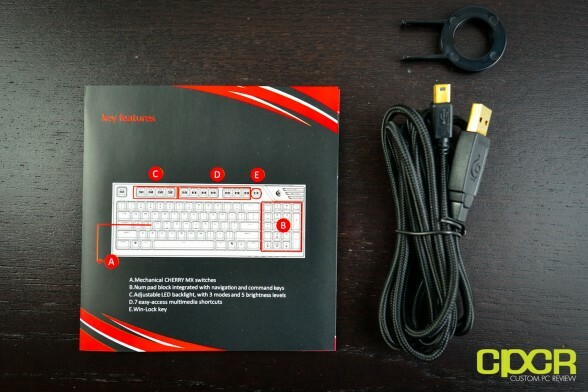 Included in the packaging, we receive a quick start booklet explaining the different features of the keyboard along with a detachable gold plated USB cable and a key cap removing tool. 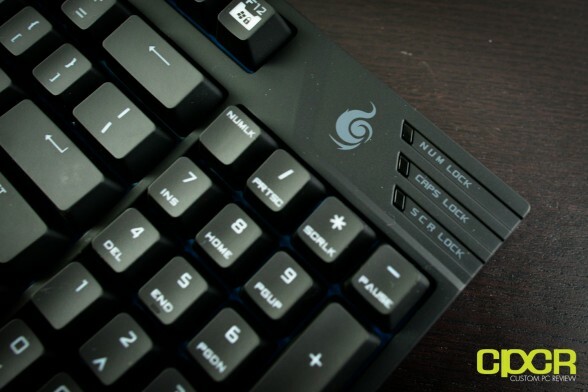 Here we get to take a look at the CM Storm QuickFire TK in all its splendor. In terms of appearance, it looks like Cooler Master is now going with a fully blacked out case rather than the old greyish case from the QuickFire Rapid. They’ve also removed a ton of the CM Storm logos that were scattered throughout the QuickFire Rapid, which gives the QuickFire TK a much cleaner, more elegant look. Additionally, you can see that the QuickFire TK is a tenkeyless design so it’s much more portable than full sized keyboards; however, notice that Cooler Master has customized the keyboard so that there’s also a tenkey pad on the right side of the keyboard. Those who still wish to have the arrow keys though will still be able to access the arrow keys since the 2, 0, 00, and period keys are dual function arrow keys. 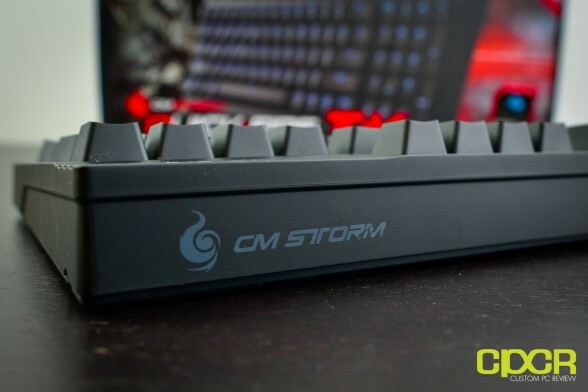 Keeping up with the CM Storm mechanical keyboard tradition, we get a single mini-USB port where the detachable USB cable will connect to the PC. There’s also a cable routing system here as well which we’ll take a look at below. Here we can see the cable routing system for the detachable USB cable that will allow you to route the cable in the direction of your PC to help with cable management. At the back of the QuickFire TK you will also find four medium sized rubber feet that provide excellent slippage protection for both normal use and intense gaming sessions. The keyboard also comes with two plastic stands allowing you to raise the back of the keyboard. The tips of these stands have also been rubber coated giving you extra slippage protection should you choose to use the stands. In combination with the Fn key, the ESC button will toggle the keyboard between 6KRO and NKRO. Why you’d ever take it off of NKRO mode is beyond me, but Cooler Master does give you the option. That said, I hear this is for better compatibility with some motherboards that aren’t too happy to see NKRO over USB in the BIOS. 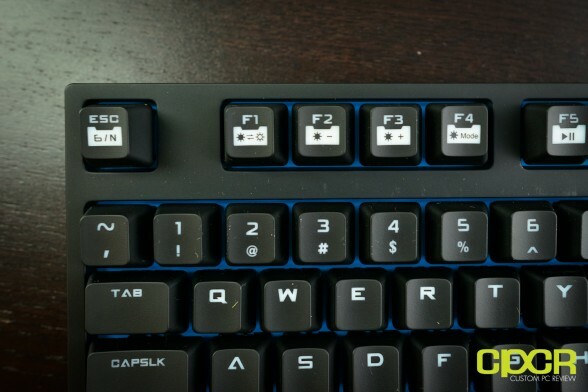 The F1 through F4 keys will allow you to adjust the keyboard lighting to your liking. Here you get the options of turning the LED’s completely off, lowering the intensity or changing lighting modes. Continuing on we see that the F5 through F8 keys in conjunction with the Fn key give you the standard media keys allowing you to play/pause, stop and skip tracks. 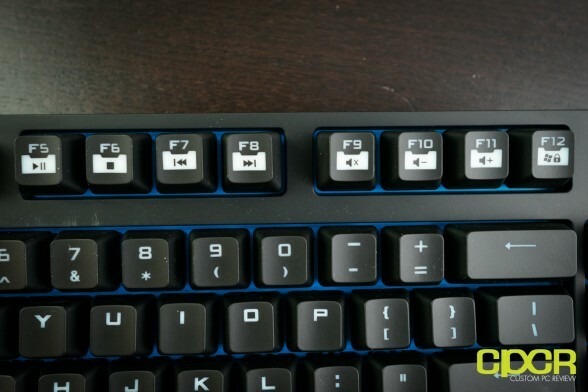 Fn+F9 through F11 will grant you access to the volume control keys and finally Fn + F12 will allow you to toggle on and off the Windows key. On the right side of the keyboard we get a closer look at what makes this design so special. As you can see the number pad which is usually MIA on tenkeyless designs is now dual function with the arrow and other keys. This is a very creative and functional design in my opinion and to access its full potential it’s quite easy. Simply press the NUMLK button to toggle between the two functions. Pulling a couple of keycaps off the QuickFire TK, we can see that Cooler Master is using Cherry MX Blue keyswitches. 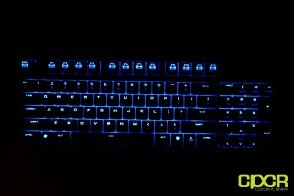 We can also see that above each keyswitch is an individual blue LED giving each key a bright and even glow. 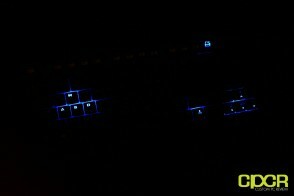 Cooler Master has also painted the backing on the keyboard blue as well, which should also increase the intensity of the glow. 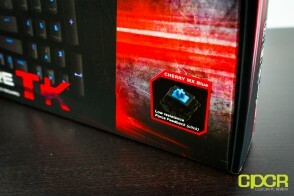 Under the longer keys, (Shift, space, enter, etc), Cooler Master is using Cherry MX stabilizers. Personally, I’ve found that this type of stabilizer slightly changes the consistency of actuation between the longer keys and the rest of the keys, so I’m not a huge fan. I personally prefer aftermarket Costar stabilizers, which offer a more consistent feel to the rest of the keys. Here we can also see one of my favorite features of the QuickFire TK, which I believe was carried over from the QuickFire Pro – the “Function Lock” key which usually sits sandwiched between the Windows key and the Ctrl key. The Fn key is usually present in most mechanical keyboards these days and serves the purpose of accessing the different function keys usually paired with the F1 through F12 keys. 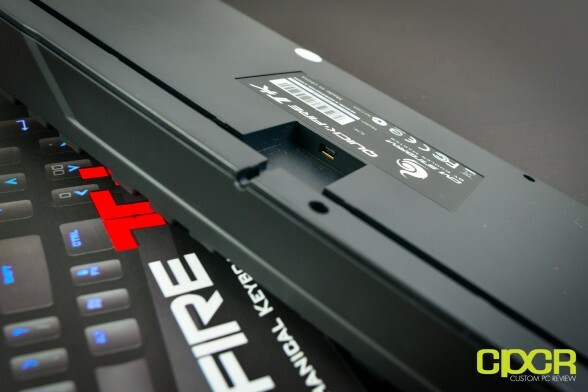 What makes the Fn key on the QuickFire TK so special is its ability to lock. This simulates the key being pressed continuously and essentially makes all the dual function keys from F1 to F12 dedicated. True it’s not really, really dedicated, but it’s about as close as it gets. 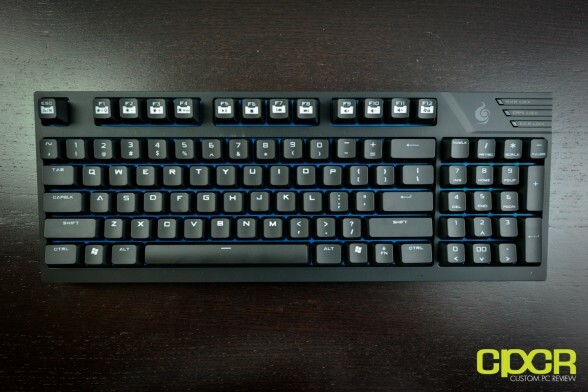 LED modes on the QuickFire TK include 3 different lighting modes. The first lighting mode only lights up the entire keyboard with a cool blue glow. The second mode is the same as the first mode except the lighting enters a “breathing” mode which will pulsate at an interval. The last LED mode in a way is a game mode that mainly lights up the wasd keys, arrow keys, the “function lock” key and the F12 key (windows on/off key). The CM Storm QuickFire TK is also capable of achieving five different light intensities that look quite stunning with the blue LEDS. If for some reason you don’t like the glow or simply would like to turn it off you have option of turning the LEDs off. I began my tests by playing League of Legends and was quite pleased with how the keyboard performed. The Cherry MX Blue switches with both the tactile and auditory feedback allowed me to have better confirmation of when my hero’s powers were executed. This was especially helpful late game during hectic team battles where a simple key press could determine weather the team fight is won or your entire team got aced. In FPS testing, I saw absolutely no ghosting at all. In Left 4 Dead 2 every key press registered flawlessly whether I was running away from an angry mob of zombies or fighting my way through their undead corpses. In Call of Duty: Modern Warfare III, I again saw no issues even when performing complicated maneuvers such as throwing a grenade back, immediately followed by crouching, holding my breath and successfully sniping my enemies. Whether it was simple tasks like throwing a grenade or complicated scenarios leading up to a kill the QuickFire TK performed flawlessly in the FPS genre. Another genre of game I tested was with fighting games although I have to admit, it was pretty much impossible to do my usual test of two player head to head fighting with such a small keyboard. As I was playing Marvel Vs Capcom, I felt that the enhanced clickyness of the Cherry MX Blue switches actually reminded me of the noise an arcade stick makes and as a result allowed me to keep track of my combos better. As usual, to test whether the mechanical keyboard truly helps in terms of typing, I decided to test my regular membrane keyboard against the QuickFire TK. To perform my experiment, I first went to typrX and proceeded to type on the membrane keyboard on my laptop (worst case scenario). I then switched off to the QuickFire TK and compared my results. As usual, I get a typing speed improvement of about 10% which is consistent with the improvement i have seen while testing other mechanical keyboards. This is why I truly believe that if you know how to type with all ten fingers, a mechanical keyboard like the QuickFire TK will allow you to not only type faster but also type more accurately. For those who don’t yet own a mechanical keyboard, I definitely encourage you to purchase a mechanical keyboard and head on over to typrX to try it yourself. The Cooler Master CM Storm QuickFire TK definitely offers some very sensible changes over the QuickFire Rapid, most if not all improvements a direct result of feedback from users and reviewers. Speaking of feedback, before we conclude with the QuickFire TK, let”s first talk about Tom’s review way back at the beginning of last year regarding the QuickFire Rapid. He didn’t like not having a tenkey… on a tenkeyless keyboard. LOL, but guess what? Cooler Master delivered a tenkeyless formfactor keyboard with a tenkey. He wasn’t a huge fan of the grey casing on the QuickFire Rapid. Guess what? Cooler Master delivered a black casing on the QuickFire TK. He didn’t like the overkill with the CM Storm logos. Once again, guess what? You get the picture. The QuickFire TK offered solid performance all around. In terms of typing performance, I experienced about a 10% typing speed improvement by switching from my laptop keyboard to the Cherry MX Blues on the QuickFire TK. 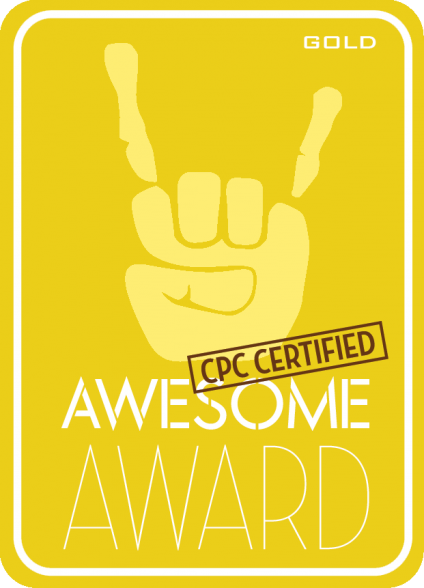 Just a year ago I would have argued that it was impossible for a keyboard to improve typing performance, but after having tested many many mechanical keyboards, I have found that I couldn’t have been more wrong. Mechanical keyboards can indeed increase your typing performance. Period. In terms of ghosting, I saw absolutely non of either thanks to NKRO over USB. The Windows on/off switch was great as well as it helped ensure that I didn’t accidentally exit to the desktop while mashing my keys in an intense round of Marvel vs Capcom. Lets talk about formfactor. 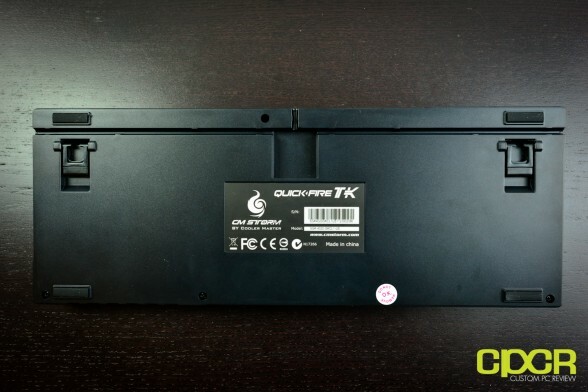 The QuickFire TK gets the portability of a tenkeyless design but also managed to include the tenkey. This to me was extremely useful especially when working on the go. Being a product reviewer as well as a full time engineer, I work with more spreadsheets than you can imagine and for me, having that tenkey is absolutely essential when a lot of numerical data needs to be inputted. The QuickFire TK solved this issue beautifully by integrating the command keys into the number pad. Enough said. In terms of durability, I think that Cooler Master once again did a phenomenal job with the QuickFire TK. The braided cable is very sturdy, and is easily replaceable should you ever find a way to destroy it. The keycaps felt very solid to the touch as well and definitely isn’t the cheap, thin stuff either. 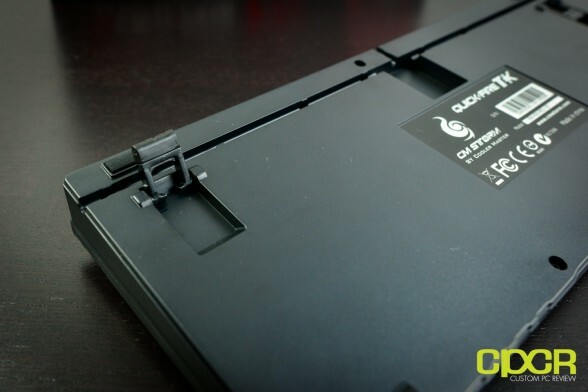 The chassis of the keyboard is crafted from fairly dense ABS plastic, and like the QuickFire Rapid, should withstand some abuse from a furious gamer. There was absolutely no flex to the board at all. 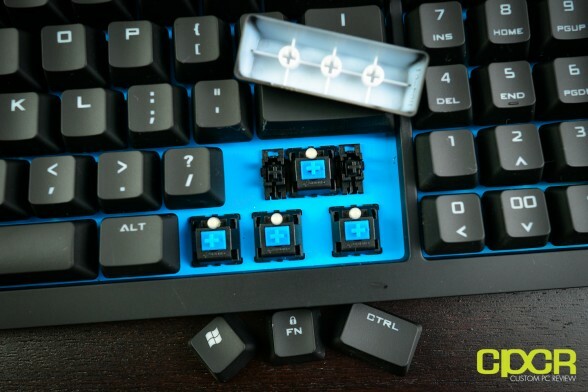 Furthermore, the Cherry MX Blue keyswitches are placed on the metal backplate to further increase their longevity and help improve signal between the switch and the circuitry. Alright so enough dreaming, let’s talk about price. 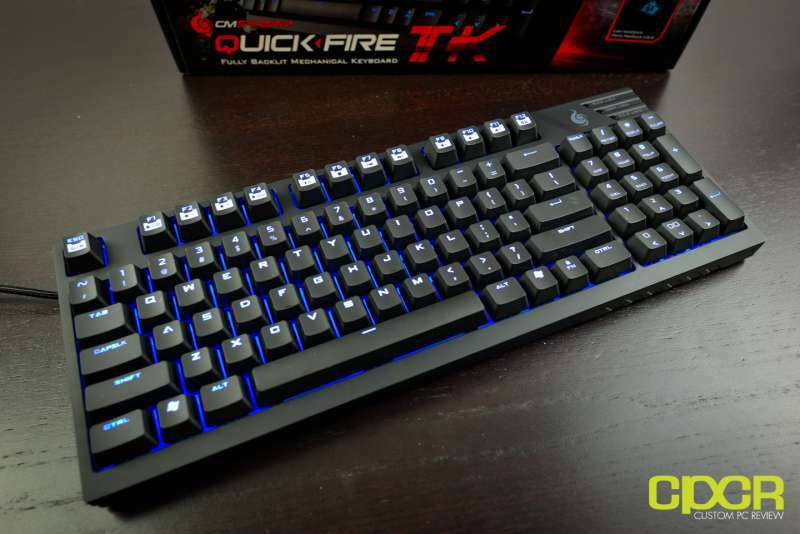 Currently the Cooler Master CM Storm QuickFire TK is available on Amazon for $89.99, which is pricey for a tenkeyless keyboard, but actually is very competitive as it’s one of the very, very few tenkeyless keyboards out there with full on backlighting. In fact now that I think of it, I don’t think I’ve ever touched another tenkeyless mechanical keyboard with backlighting. Yeah, it’s that rare. 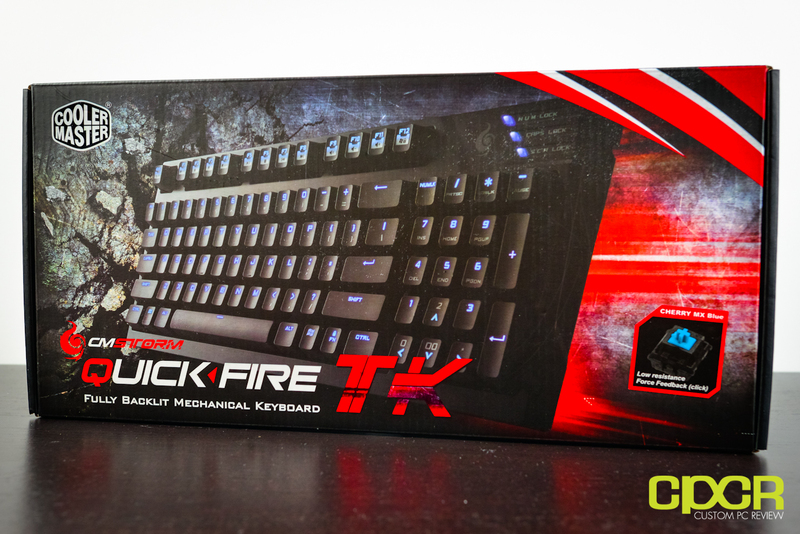 If you want backlighting and you want tenkeyless formfactor, the QuickFire TK is the way to go. If you want tenkey on a tenkeyless formfactor, then once again, the QuickFire TK is the way to go. ah i should taking this one, instead of leopold fc500r. 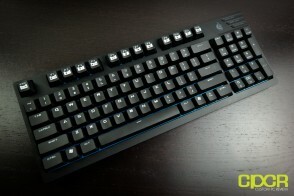 at my place, this cm storm quickfire tk cost around $110.sigh.. So this article and keyboard is now around 3 years old and I’m just now picking one up. A shame CM did not take the writers suggestions or others and make a newer model in those 3 years. I wonder why? They would surely have a big hit keyboard if they did. I just don’t think many of these companies really have normal gamers or intelligent people working for them or at least they are not listening to them. The guys in the suits running the show are always about money yet all that Harvard education doesn’t seem to be working for them I guess… Anyways I was wondering if they ever fixed the “00” ghosting problem others complained about or if they actually were working on a program that would allow you to change profile light animations and such or even if there was enough onboard memory to even do this? Anyone made any hack firmware yet over the last 3 years for this board?